Oct. 26: "Turned to this morning at three bells and washed out the Capt. 's office, then went ashore in the boat. I have been in the boat the rest of the day, going back and forth." 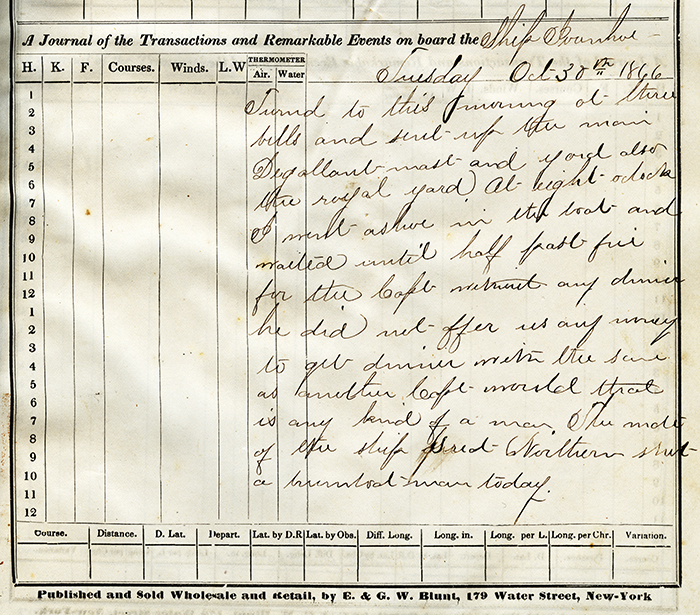 Oct. 27: "I have been in the boat all day....Finished discharging our cargo this forenoon. The Capt. sent five Peruvian dollars to me by Bill for standing watch in Frisco....I stood thirteen nights and he agreed to give me a dollar a night. I want my just dues and no more. I think I shall speak about it if I have a chance." Oct. 28: "After breakfast set the Capt. ashore, after I got back washed a pair of stockings and done a little sewing. After dinner set the mate and carpenter ashore. I bought a pair of shoes of a navy chap with whom I am acquainted for two dollars....have to pay four ashore." A light rowboat, powerboat, or sailboat, often used as quick transport for the ship captain or a lighthouse keeper. The gig was designed for speed, not as a working boat. came and relieved us; it is now nearly dark and they have not got back yet, so I do not think our (?) will come up tonight." Someone who betrays a party or cause. man today." The area on board a vessel where the ship's crew members gather to eat their meals. room floor. We have been pulling the boat off and on all day. We got underweigh about dark tonight with a light breeze. The ship Living Age came in this morning, she was built in Belfast."